As regular readers of my blog will know, I enjoy creating terrain. Initially it was terrain for my 28 mm Napoleonic games, here the look was important and the challenge was re-creating the look of historical battle fields but at the same time doing it in a footprint that allows battalion level gaming. Here buildings can not be scale to their footprint, but one has to try to preserve the vertical scale so the figures do not look like giants in comparison to the buildings, quite a challenge really. I next moved on to some Dark Ages skirmish war gaming, pretty easy really, as there are few complex structures, so a few hovels and some trees on a terrain board will usually do. There are lots of 28 mm scale buildings available for this era. Last summer, I finally decided to do some WWII skirmish wargaming with the introduction of the Chain of Command rules. I decided to do this in 20 mm as there was lots of affordable figures and vehicles, and I really did not want to spend the money or do the work of painting 28 mm figures. I was done with 15 mm figures (I had painted 2 North Africa armies and sold them), and they just do not do it for me in respect to skirmish wargaming especially with WWII. All the little figures have different weapons which I want to be able to see, so 20 mm seemed an ideal choice. And although the people who I game with use 15 mm figures, I do not regret my choice. In the fall, I was introduced to the Skirmish Campaign books which are somewhat adaptable to Chain of Command and we have been lumbering along with a Eastern Front campaign that I have quite enjoyed. I had a look at the different books available from the company and decided to buy the Normandy, 44 Red Devils as well as the Finland-The Winter War books. Different reasons for this, but mostly to do with the fact I am from Canada and the Great White North. I wanted to do some battles with Canadian troops and I want to do some battles on a winter terrain. Logical..............right! First up was Normandy, I had the German troops but minimal German vehicles and no Paratroopers, so the late fall was devoted to researching the manufacturers, acquiring the figures and painting them. I selected the 3 scenarios surrounding the Le Mesnil Crossroads, mostly because the terrain set up was the same for all 3 scenarios, and I could use very similar terrain elements for the final 4 scenarios in the book. I was told by one of my gaming colleagues that these scenarios were probably not easily adapted to Chain of Command. This does not really worry me as I am really not that rigid, and at the same time the campaign supplement At the Sharp End for CoC has been published. I am pretty sure I can get a good campaign from using the OB's and Support lists from the SC pamphlets, but using the actual scenarios from CoC in conjunction with the Campaign rules. I am sure it will all work out. So on to the terrain, well I had to decide what was important. One thing I really have found difficult with our Soviet games (and this is certainly not a criticism) is that we did not use real terrain pieces. It was easy enough to remember that dark green felt is a heavy forest, but at the skirmish level the movement and line of sight is completely dependent on the well delineated terrain. I like WYSIWYG, easier said then done really, but I felt I would made a valiant effort. I looks around at a lot of blogs and a lot of terrain and came up with some ideas. I did want to stick with the terrain layouts as described in the SC pamphlets. Finally, I tried to make each terrain item functional in respect to skirmish wargaming. Less important to me was accuracy of the building and terrain items to Normandy. I did try though, but I suspect the buildings and walls as well as the fact that I have used a coniferous forest, may be a little off. Finally it had to be transportable. Anyway on to the photos, the terrains in the 7 SC scenarios in the Red Devils book are designed for 15 mm vehicles and figures and are generally 2x3' or 2x4' in size, where I was using 20 mm figures, I felt it was pretty safe to go with the standard 4x6' CoC terrain board. Here is the terrain looking from the west, we are 200 yds northeast of Le Mesnil Crossroads. I used a 2" thick dense pink styrofoam board. I cut it down to 4x6' and then split it in two length wise so I can get it in my car (We have two little cars, so this is a challenging bit). The edges were all covered with duct tape for protection and the hill to your right was sculpted into the basic terrain. The board was then painted with black paint. I find it is safer to give a coat of paint first and then add some detail. The course of the roads was defined carefully with a blow torch (one of my favourite bits) as well as the edges of the hill. I then placed a mixture of fine sand with PVA glue where the road went. Some loose stone was added to the board and the whole board was sprayed with matt medium/PVA combination. The terrain was then rolled with one of those texture rollers with a brown raw umber paint. The whole thing was drybrushed with mocha colour followed by a cream. I then went over the roads, the stones along one edge of the road and the edges of the hill with a heavy wash of watered down black. I then added various different flocks in fine and coarse grades to give some colour. I also used the different colour flocks to define the important features of the terrain so it would be easy to place the right bits in the right place after transport. This includes the two walled structures and the forest. Then two very heavy sprays of the matt medium/PVA combo. The basic board is now done. I think if I had my time back, I would not have modelled the hill into the board, but otherwise things were good. Here we are looking northeast up the road. I really have little knowledge of roads in Normandy, this is I think a major connecting rural road, so I might of made it a little more smooth and maybe wider. The rubble on the right side of the road will provide soft cover in game play and be treated as broken ground for movement. The bocage of course will be hard cover and a major obstacle for movement. Here is a dense forest, in CoC this is prevents vehicular traffic and is heavy going for movement. LOS out is restricted to 4". LOS within is 12". Making forests is a bit of a chalenge, I have some nice tree stands from Architects of War, but they really are not easy to transport. I have snapped off several of the plastic Woodland Scenics trees that come with the stands and it is a challenge to keep the foliage on them. I needed something more durable, these are Grand Central Gems, both fir and spruce I believe. They come in bags of 20 for $20, so not a bad deal. I have been sticking them directly into the styrofoam, but I wanted something a little more solid. Gale Force Nine has some nice terrain mostly for FoW, but I noticed that they used 3/16" rubber bases. I searched about and then thought of car mats, these are fairly flexible but durable rubber. So I bought one large truck mat and viola. I am quite happy how it worked. I terrained it first to match the rest of the mat and then forced small holes and fed through the trees, I pushed them through about 1/2" extra and this keeps it in place on the mat. Here is the first of two building complexes on the terrain, the house is from Italeri 1/72 scale and the roof comes off, so all good for skirmish wargaming. The stone wall which according to the scenario is 6-8' high, will be a major obstacle and hard cover like bocage. Like a building you can fire out if at the edge only. The wall is from the Hovels Hougomont collection in 15mm, and although out of style I believe, works well in a WYSIWYG terrain set up as you will see below. The second building complex required was a farm complex with 3 buildings, one two story and two one story, well not exactly but I had to use what I had, as I wanted buildings that were scale and the roofs could be removed. The farmhouse it self is also from Italeri, but the wall and the other two buildings are from 4-Ground, really absolutely superb buildings. Unfortunately the walls are a little low as they are suppose to be similar to walls around the house being higher then a man. I will keep searching around and maybe find something a little better. For the stone house you can see that there is a vehicle gate and small gate, which allows fre movement of vehicles (except tanks) and infantry respectively. Here is a standing crop field, this was the most time consuming piece to make, as I wanted something that would hide infantry (ie around 20 mm high). It was a lot of work, it is on a hard plastic rigid base and I used a railway terrain product from Busch. I glued the cornstalks on the base and then build up the terrain with wood filler. It came out quite nicely but I am not sure if it was worth it. They are quite flexible in that they bend over, so will be easily deformed by a tank moving through the field (hopefully not damaged though). It will be treated as rough ground for movement but vehicles will have to take a bogcheck upon entering. Infantry will have light cover. LOS out will be 6" and 12" within. Tanks do not have LOS affected. Here we are looking from the east to the west at the dirt road that runs behind the farm complex. Again the road is lined with stone on one side and bocage on the other. I have not talked a lot about the bocage, it was relatively easy to make, the base is a 1x2" strip of styrofoam mostly cut in 6" lengths. I then used some sort of epoxy to fix this superb furnace filter product on the piece of styrofoam. The base was the painted with PVA and fine grit, as I used a raw umber aerosal spray to paint the piece (the aerosal will dissolve the styrofoam if not protected). I then used a mocha brown aerosal in a light coat to give it some depth. The whole piece was painted with a second coat of PVA and a fine flock of 3 different colours was applied to the base and a coarser flock to the bocage, also in there different colours (darker to lighter as you approach the top). Woodland Scenics products were used for the flocks. I will discuss the height of the bocage a little further down. Here are two low crop fields, I used small pieces of Zuzzy Mats, which are a soft textured latex to make them. It is a great product, as I can turn these out quite quickly. Painted in raw umber, and subsequently drybrushed with a mocha and the a cream. The crops are from Tajima1 in the UK, they are sold as strips of different colours that are self adhesive. Really a suberb product with excellent service. These are the leafy green and golden yellow strips, the narrow strip in to the south of the farmhouse is their gorse bushes. They will be treated as rough ground for movement and vehicles will have to take a bogcheck upon entering. Infantry will have light cover. LOS is not affected. The scenario also called fro a small orchard, I used the same technique with the rubber mat as the forest but used much smaller deciduous trees in rows. Maybe a less successful affect. This will be broken ground for movement and provide light cover. LOS out will be 6", within is not be an issue as it is only 10" square. A little better look at the wall around the garden. There is a gate that allows unimpeded infantry movement. I really like how the forest came out. 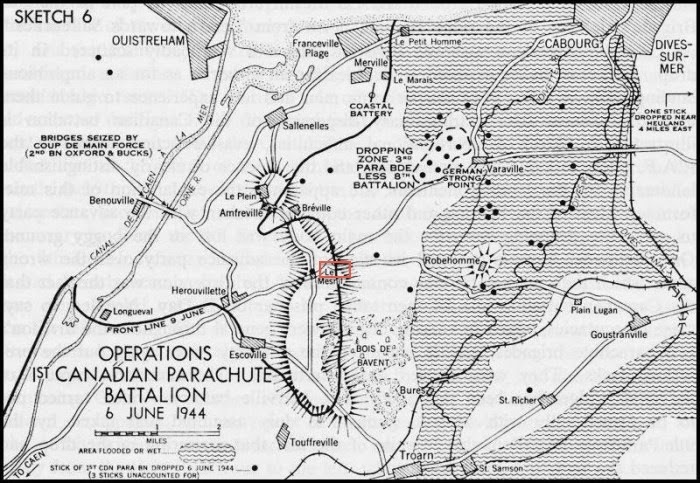 A Canadian paratroop section with the SL. You can see that the wall is a nice height. German LMG team in soft cover. German rifle team moving through open ground with JL. German SL's directing the troops. As a matter of interest, I was able to download this image from googlemaps. Most of the bocage gone I am afraid, and the walled farm is set back more from the road. But quite amazing how much is still preserved. This was a really enjoyable project and all in all I am quite pleased on how it came out. I am a little unsure about the height of the bocage, my research tell me 18-20', but I think the vertical scale here may be off visually. Any thoughts? Well now on to the snowy fields, certainly a much less complex project. Nice Work John! I realy like the standing Crops we could have used them last night. I love that they can be pushed flat. A fantastic looking terrain, no doubt! This is superb work! I can't wait to see your AARs utilizing your new terrain. On bocage, I was just talking to a friend about this during our first game of CoC. He said that the height varies. The important thing is your terrain looks great! Some wonderful looking terrain, John! Beautiful work John! I've been looking at those Italeri buildings at my local hobby shop wondering if I should pick them up and I think I'll take the plunge after seeing yours. I also really like your bocage though it seems quite tall but I guess its probably in true scale. The truck mat tree sections are brilliant as well. Now I just need to come down to have a game with you! Wow, you have got some amazing terrine there John! Especially like how you have blended the one building with the hedgerow! Looking forward to the AAR.